Returning to the beginning, usually as a result of failure. Example: We couldn’t decide where we wanted to travel to for our vacation, but after discussing things further, we finally chose the city of Miami. Then we realized it would be too expensive to go there, so now we’re back to square one. The children’s game Snakes and Ladders. Does the phrase come from this board game? 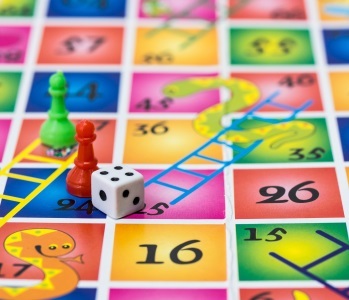 #1: It’s thought that this phrase may come from the board game Snakes and Ladders. This game is played on a board that looks like a grid (as seen in the picture above). Players start on square one and their goal is to reach the end. Progress is made on the board by rolling dice. There are a few pictures of snakes on the board. If a player lands on a square that has one, then they are sent backwards a certain distance. Sometimes, landing on a snake can send a player all the way back to the beginning, to square one (hence the phrase). Of note, there are various board layouts for this game with snakes in different locations. So not all boards have snakes on them that lead back to the starting square. #2: This expression may have come from a children’s game known as hopscotch. Hopscotch is played with multiple people and the course takes place on numbered squares that are written onto the ground. Players throw a marker into one of the squares and then they try to hop through the course while avoiding the square with the marker in it. A player’s turn ends if they make a mistake. These mistakes include stepping on a line or losing balance and falling. Depending on the rules, once it’s their turn again they can do one of those things. They can either resume from the square they left off at, or they have to return to the beginning, back to square one (hence the expression). Jake has been building a sand castle for the past twenty minutes. However, he had to go back to square one after he tripped and fell onto it.